April is AQS (American Quilter’s Society) Quilt Show time in Paducah, Kentucky. If this sounds like a boring time to you, boy, are you in for a surprise! This show is not just for grandmas. It attracts men, young people, and an international crowd. Contestants, demonstrators, and enthusiasts come from as far away as New Zealand, Australia, the Netherlands, and Japan, where this American art form has a huge following. And these are not your grandmother’s quilts — these breathtaking creations are pieces of art worthy of being displayed in museums or art galleries. Entering the Paducah Expo Center and strolling slowly down the aisles of contest entries one hears “Ooooh!” and “Ahhhh!” and gasps of admiration coming from all sides. Eager to round the corner to see what’s causing all the excitement, yet mesmerized by the incredible beauty of the specimen before you, you could spend the entire day just viewing the works of wonder in the main contest hall. Yet there is so much more to see! Are these just quilts or the canvases of the most incredibly gifted artists? Stunned by the design and workmanship of each entry you wander on to the next aisle and the next, to be struck anew by the colors, the patterns, the imagination. No, this is not JUST a quilt show. This is awe-inspiring! Leaving the main hall at last with your newfound enthusiasm, you find the many vendor booths and product demonstrations just as fascinating. And if you can tear yourself away from the Expo Center you will find that the quilting frenzy fills the entire city. Quilting shops around town are hosting guest speakers, demonstrations, and classes that run into the night all week long. A bus route has been set up to take visitors to the city anywhere they want to go to ensure they don’t miss a thing. But it would take a week to see it all. This is definitely not a one day event. 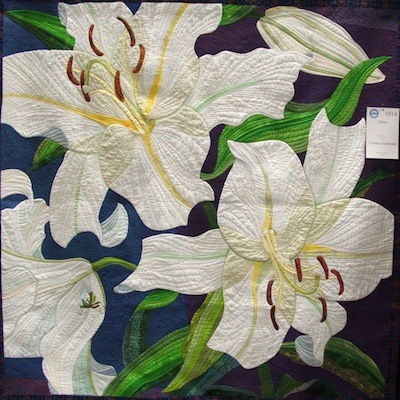 So if you’re into quilting — or just in the area — make a beeline for the 29th Annual Paducah Quilt Show April 24 through 27 in 2013! You’ll never forget it.